Mario Kart has now arrived to its eight game in the franchise which, similarly to the previous game, is just called Mario Kart 8. But the real question here is, is Mario Kart 8 as good as the previous entries in the series? And let me tell you that the answer is definitely yes and even better. Let's start by analyzing with the most basic thing of any game, its gameplay. The game controls pretty much perfectly and literally have ever possible controller as an option to use. You can either use motion or not, and it can be either the Gamepad, Pro Controller, Wii Remote, Nunchuk, or Classic Controller. The Gamepad offers a slight advantage because it's the only way to access the map of the course, as this isn't displayed on screen now. The tricks that started on Mario Kart Wii are back again but this time, they are triggered the same was as it was in Mario Kart 7 on the 3DS. This may cause a bit of confusion at the start to people who are used to the style of the previous home console entry, but you'll quickly get used to it. The controls are tight, responsive, and easy to learn. Mario Kart 8 brings back the bikes (without wheelies) from Mario Kart Wii and the part building, glider, and underwater mechanics of Mario Kart 7, but introduces a new anti-gravity system too. The way anti-gravity works is very simple, certain tracks have segments or paths that may use the walls or even the ceiling of the location. Those sections have an anti-gravity strip that automatically switches your vehicle into anti-gravity mode. It's actually quite easy to get used to it even, as the camera always follows you from behind, only slightly tilting in these sections. An interesting change while in anti-gravity is that bumping into other racers will actually make you both spin (without losing control) and then gain a boost. A small mechanic that has changed this time around is the item system. Since Mario Kart 64, every game in the franchise let you have two items at once, one being dragged and the other on your item box. This time it's different, though. You are only able to hold one item at once. Even if you are dragging it, the item will still use the slot in your item box. This changes the way the game is played quite a bit, since you know have to think twice before deciding to use any item. It really feels like it changes the strategy of the game. It is definitely not a bad thing, though, since it makes the races more interesting. The guy in first place, for example, now isn't as invincible as in previous games. Triple red shells suddenly become really deadly as usually you'll only have one item to defend yourself at most. But that also brings us with a necessary change in the item system, the items themselves and distribution of them. 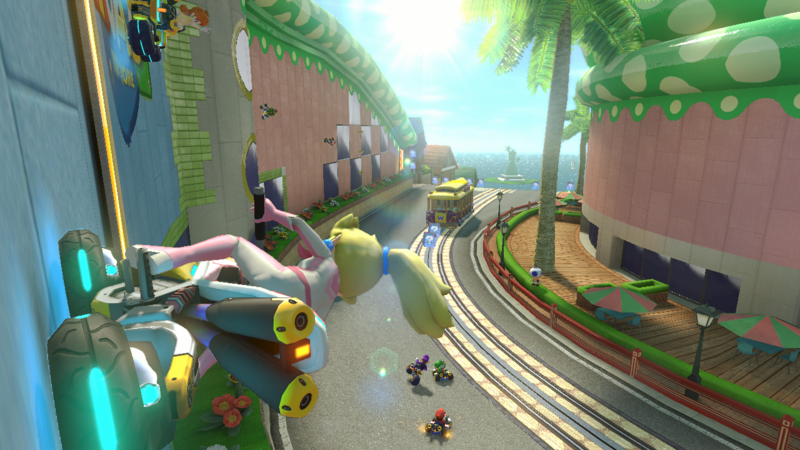 First, there are several items from Mario Kart Wii and Mario Kart 7 that aren't back. Those are the Thundercloud (thankfully), the Mega Mushroom, the Fake Item Box, the Tanooki Tail ( T_T ), and the Lucky 7. But obviously there's also new items that appear in the game in exchange. These are the Coin, the Boomerang Flower, the Crazy 8 (called Miracle 8 in Japan), the Piranha Plant, and the best of all, the Super Horn. As you may have already heard from ads from Nintendo, the Super Horn is the ultimate defensive item as it can destroy even the much hated Spiny Shell. The only item the Super Horn can't block is the Thunder. The Super Horn is actually quite easy to use to block items and you can also even use it to hit players around you, as it sends a shock wave all around your character. Another great new item is the Boomerang Flower. You can use it up to three times as it comes back to you the first two times you throw it. You can use it either forward or backwards and it can destroy any banana peel or shell without being destroyed itself. As for the other items, you may have already predicted that the Crazy 8 has a very similar effect to the one of Lucky 7 in Mario Kart 7. The only difference is that this time it's eight items, instead of seven. The Piranha Plant is a decent item that protects you from the front by eating and attacking nearby obstacles and players and at the same time gives you a small boost with each bite. And then there's the coin. The coin can be useful, but at the same time quite bothering. It's only use is to give you two more coins, but that brings us to another aspect of the game, the item distribution. The problem with the coin is that it sometimes can be a bit too frequent when you are in first place, thus leaving you completely defenseless. But the item distribution overall isn't bad, though. It seems that this time, Nintendo decided to base the item probability based on the distance between the racers, instead of just their position. What this means is that thankfully, just because you are in first doesn't mean you'll get really bad items. If the competition is packed close, you'll still get decent stuff like green shells or banana peels to defend yourself. And of course, one of the items you can get in first is the Super Horn. Overall, it feels like the item distribution feels quite balanced this time. The Spiny Shell isn't even that frequent this time around and even though there's the Super Horn now, you can still dodge them with a well-timed Mushroom boost. In the graphics part, this is the first time we get a Mario Kart in HD, and Nintendo has done an excellent job to show it. The game runs at an HD resolution of 720p and in constant 60 fps always, dropping to 30 fps only when playing with 3 or 4 players. The graphics are gorgeous and the best to date on the Wii U. All characters have really smooth 3D models and high quality textures. They also have nice looking animations which have a lot of detail on them. The retro tracks look so much better that they are quite unrecognizable, honestly. Moo Moo Meadows from Mario Kart Wii now showcases some excellent lighting effects with its beautiful sunrise lighting the course and the characters and N64 Rainbow Road is just completely stunning. The new tracks don't look bad either, of course. 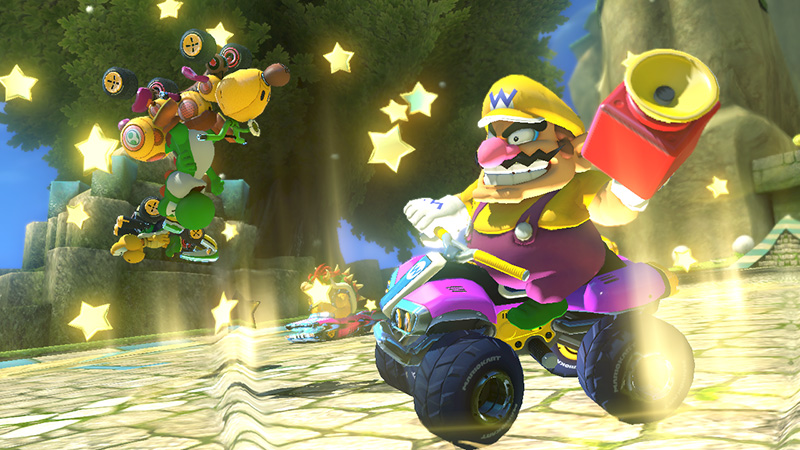 Tracks like Electrodrome, Mount Wario, or the new Bowser's Castle look great. Even the first track with it's night-time setting, Mario Kart Stadium, looks really good and quite enjoyable. There are a few lower resolution textures mixed between the high resolution ones, but they are barely noticeable, honestly. You have to really look for them to find them. On the soundtrack part... well.. what can I say. I can summarize it in one word, wow. Just simply, wow. This is the first time in the history of the series that uses fully orchestrated soundtrack and let me tell you that it's beautiful. There's the fact that you'll probably will just want to stay on the title screen just to hear the beautiful theme of the game. All of the music of the game is excellent and you'll never have enough of it. All the new courses have beautiful music and the retro tracks have wonderful remakes to their themes. The 1st place beat from Mario Kart 7 is back too, which makes the music even more catchy. 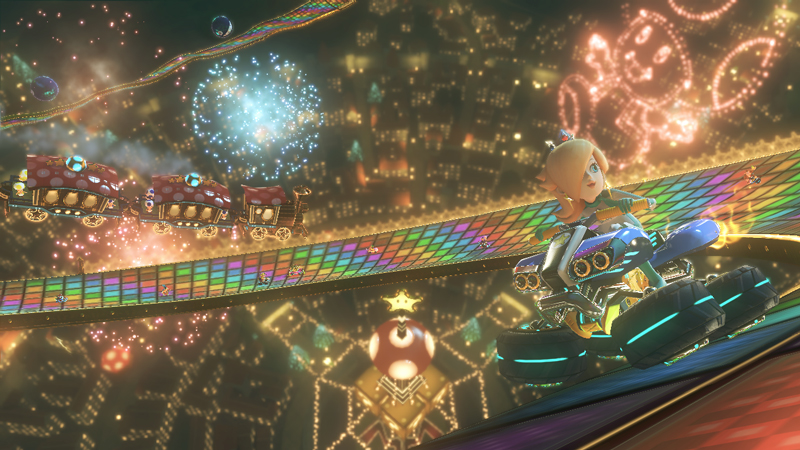 Related to game modes, Mario Kart 8 includes the usual Grand Prix, Vs, Time Trail, and Battle modes. An interesting here to note is that Grand Prix is actually back to its former glory, letting you play it in multiplayer and this time up to even 4 players at once! The last time this had happened was back in the GameCube with Mario Kart Double Dash. Vs mode let's you configure a custom GP the way you want, including team mode, type of items, or amount of races. Something sad to note hear, though, is that team racing has been downgraded, as now you can hit your own team mates. This pretty much makes playing with that option complicated, specially when CPUs are involved since they won't care if you are on the same team and still attack you. Time Trails are exclusive to 1 player and work like usual. The Ghost System, sadly though, doesn't work as easy as before. It's actually hard to find the ghosts from your friends and you need to actually press the upload button to distribute your time and ghost data, otherwise it just stays stuck on your console. The easiest way to find time's from your friends is actually throughMarioKart.TV , which is odd. Then there's the new Battle mode. Sadly, this time around there's only Balloon Battle and it has a time limit. Nintendo also decided that this time, instead of creating new specific courses for battling, to just reuse certain racetracks. This is has both a good side to it and bad side. The good thing is that with 12 players on the map, now it actually doesn't feel as cramped as before. Each player can have more space to move around and properly fight. But then there's the bad side. When there's only a few players left, it actually becomes quite hard to find others on the course. You can literally be on the other side of the course and both players trying to even find each other for a good while. And if there's players who lost before the end of the round, they become ghosts, which can still attack other players but are completely invincible and invisible themselves. They don't earn any points, though. Both, VS and Battle, are available to play online as well and let me tell you that it's a blast. The game's online works as good as the one from Mario Kart Wii or Mario Kart 7. There's barely any noticeable lag, and either way, the game is always fluid on your side. What I mean with this is that when there's lag, it's just a slight jerkiness from your opponents' characters, nothing else. And in addition to usual online play options, though, Nintendo also introduced a new Tournament mode. It works similarly to the Community mode of Mario Kart 7, except that it lets you customize it even more, and then also select a specific schedule in which the tournament will be active. During this time, people can join your tournament and earn points which will earn them a spot on the leader board of the current tourney round. You can also join a tournament while it's not active, but it's intended for practice and points will not be saved. An additional cool thing to comment on the online part of the game is that the game supports voice-chat in Friend rooms, specifically while in the lobby and not during the races. As far as unlockables go, the game does have quite a few things to get, but all of them are too easy to. Characters are unlocked by simply getting 1st place on the Grand Prix, it doesn't matter which difficulty you do it in, and they always unlock randomly. Sadly, some of the characters you get to unlock aren't that unique and are simple retextures, such as the new Pink Gold Peach. Gone are characters like Diddy Kong or Birdo. The only good thing is that you'll actually get to unlock all of the seven koopalings. Another thing to get are several vehicle parts which you randomly get too with the amount of coins you get. Every certain amount of coins, you'll unlock an additional part. There are a few special things to get which do require specific special conditions, though.